Rep. Sean Patrick Maloney (D-N.Y.), one of six openly gay members of Congress, declared Wednesday his bid to become the next attorney general for New York. Maloney, who currently represents New York’s 18th congressional district in the U.S. House, announced his bid to become New York attorney general in an interview with the New York Times. The job for New York attorney general is open in the aftermath of the resignation of Eric Schneiderman, who stepped after an explosive media report he sexually abused women. Other Democrats who’ve announced bids for the seat are Leecia Eve, a former top aide to Hillary Clinton and New York Gov. Andrew Cuomo; New York City public advocate Letitia James; and Democratic activist Zephyr Teachout. The primary is Sept. 13. As a co-chair of the LGBT Equality Caucus, Maloney has been out front on LGBT issues during his three terms in Congress. 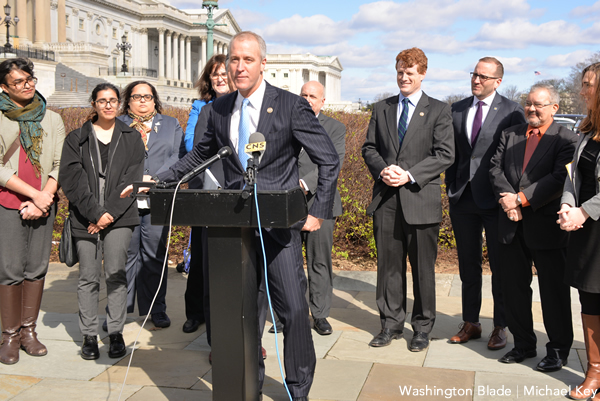 When congressional Republicans sought to pass an amendment to defense legislation that would have undermined President Obama’s executive order against anti-LGBT discrimination among federal contractors, Maloney led efforts to pass a different measure that would have undermined Republicans. Although Republicans successfully blocked the Maloney amendment, they dropped their own amendment from the defense bill. Maloney hasn’t resigned his office as he pursues election as attorney general, nor he has said he won’t pursue re-election to his U.S. House. According to Roll Call, Maloney told the newspaper Democrats will have a plan to hold on to his House seat, which is considered a swing district, but won’t say what it is. Asked what the plan entails, Maloney reportedly said, “I think I’ll leave it right there.” He reportedly also declined to comment when asked if he had spoken to potential candidates for his seat. According to Roll Call, New York’s 18th District is one of 12 in the country that won by both President Trump and a Democratic running for U.S. House in 2016. Trump carried the district by 2 points. Maloney was elected to a third term by 13 points.